Raith Rovers hit two late goals to win at East Fife and move to within 10 points of Scottish League One leaders Arbroath. Rovers trailed to a Kevin Smith strike but Iain Davidson and Kevin Nisbet netted in the final three minutes. Arbroath, who had been hoping to win the division by capitalising on a Raith defeat, lost 2-1 at Forfar Athletic. Elsewhere, Airdrieonians beat Brechin City, Stenhousemuir won at Dumbarton and Montrose defeated Stranraer. 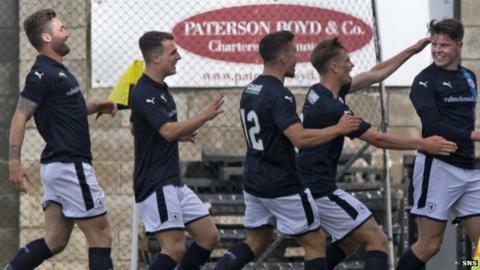 At Station Park, Arbroath led through Michael McKenna but Dale Hilson levelled and Lewis Moore clinched victory for Forfar in the 89th minute. Bottom side Stenny are now just two points behind Strantaer after scoring two goals to the Sons' one at the Dumbarton Football Stadium. David Marsh and Conor McBrearty put the visitors in command before Craig Barr's late consolation. Stranraer were beaten 3-1 at fifth-placed Montrose, with Lewis Milne, Euan Henderson and Paul Watson on target for the hosts before Andrew McDonald pulled one back. Montrose remain a point above Airdrie, who were 3-0 winners away to Brechin with goals from Kyle Wilkie, Scott Stewart and Leighton McIntosh.